The Longer/Wider Magnum 360 is our newest cage design as well as our most popular ever. It incorporates all of the features of previous models and a many more. 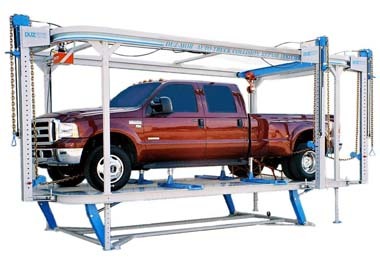 It’s has the stance that allows you to work on any sized vehicle from the smallest unibody car to the crew cab trucks and SUV’s. The cage has long been considered by many to be the only true production machine on the market! Also proven to be an excellent sales tool, why limit yourself ? It’s loaded with profit making features that will boost your bottom line without killing yourself!